What follows are the FAQs from September 2018 which we have grouped into sections. If you have a question to which you cannot find the answer, please email enquiries@croxleydanes.herts.sch.uk and we will get back to you as soon as possible. Q: How do we apply to the school? A: To make an application to the school for 2019 secondary transfer, parents must complete two applications. Firstly, they must apply online to their Local Authority, selecting Croxley Danes School as one of their choices. Secondly, parents must complete the school’s Supplementary Information Form (SIF) – also known as an application form. Parents must return it by post or by hand to Croxley Danes School, c/o The Admissions Officer, St Clement Danes School, Chenies Road, Chorleywood, Hertfordshire, WD3 6EW by 31st October 2018. Applications after this date will be accepted but classified as late applications. Application forms (SIFs) can be downloaded from the school’s website or can be found as an insert to the school prospectus, which can be obtained from the main visitors’ reception at Croxley Danes School, 3 Wolsey Business Park, Tolpits Lane, Rickmansworth, Herts, WD18 9BL. A: The admissions criteria for secondary transfer in September 2019 can be viewed in the admissions section of the school website. Alternatively, parents who obtain a copy of the school prospectus will find the admission arrangements included as an insert. Q: Will there be an academic entrance exam like there is at St Clement Danes and other local schools? A: New schools are not permitted to select on ability, so there will be no academic entrance exam. Q: How do we apply for a place based on musical aptitude? Q: What will the cut off score for musical aptitude places be? A: Students were first admitted under the musical aptitude criterion in September 2018, so there is only one year of historical information. In 2018 the pass mark for the aptitude test was 43 and the lowest performance score allocated a place was 20. This information is available on the school’s website in the ‘Admissions’ section. Q: What will the catchment area of the school be? A: In 2018, the last accepted place was awarded at a distance on National Offer day (1st March 2018) was 3241m from the address point on the permanent site of the school in Baldwins Lane, Croxley Green. The postcode for the permanent site is WD3 3RT. Q: How many places will be offered in Year 7? A: 180 places will be offered in Year 7 for September 2019. Q: How many applications did the school receive for secondary transfer for September 2018? A: The school received 779 applications. Q: When will I hear whether my child has been awarded a place? A: Parents will be informed on national offer day (1st March 2019) whether they have been awarded a place at Croxley Danes School for September 2019. Parents will then have a deadline by which they must inform their Local Authority whether they will be accepting that place, otherwise it will be re-offered. Q: Where is the permanent site for the school? Q: Is the site on Baldwins Lane big enough to accommodate a school? A: Yes, the site certainly has the capacity to accommodate a six form entry (180 students per year) secondary school, with an ultimate capacity of just over 1200 students. It is almost 40% larger than the St Clement Danes site which currently accommodates around 1500 students. Q: What is happening about the permanent buildings? A: Planning permission was awarded for the Baldwins Lane site in January 2018. The building contractor (Kier) commenced work on site in April 2018. Our latest news on the school website shows that the foundations are currently being laid: https://www.croxleydanes.org.uk/190/latest-news/post/109/progress-on-site-in-baldwins-lane .We are pushing for the school to be entry ready for Easter 2020. It will, however, take a few weeks with no children on site to decant from our current accommodation in Tolpits Lane into the new build. It may, therefore, be our preference to remain at Tolpits Lane until the end of the Summer Term 2020, to give ourselves adequate time to move during the summer holidays without adversely affecting the students’ education. We will, however, be in the new school building by September 2020. Q: What will be the accommodation for the school in 2019-20? 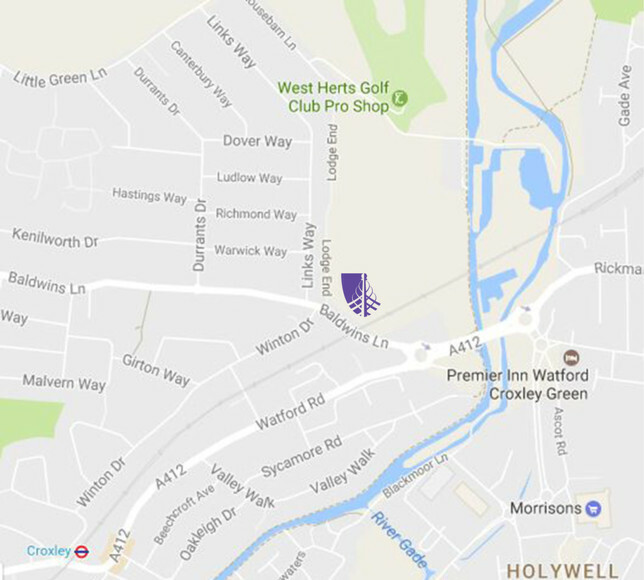 A: During the summer holidays this year the school moved from its 2017-18 location at St Clement Danes school, to new temporary accommodation at 3 Wolsey Business Park, Tolpits Lane, Rickmansworth. The new temporary accommodation has benefitted from a £0.25m refurbishment and brand new furniture and equipment has been installed, so the school has a very fresh feel about it. During 2018-19 the students are still attending St Clement Danes for one day per fortnight to access specialist facilities in PE and technology, but that will not be possible in 2019-20. We are already approaching other local schools to explore ways of putting on such specialist provision more locally from September 2019. Q: What are the arrangements for Headship in the new school? A: Josephine Valentine is Chief Executive Officer of the Danes Educational Trust and oversees both St Clement Danes and Croxley Danes schools. Stephen Thompson is Headteacher of Croxley Danes School. Q: Will the new school employ qualified teachers? Q: How do I go about applying for a job at Croxley Danes School? A: Please visit the Vacancies page of the school website where we will advertise posts which become available. Q: What subjects will my child be able to study at GCSE? A: The projected curriculum for Croxley Danes School is the same as the current curriculum at St Clement Danes School. Although it is some way off, the students joining Croxley Danes in 2019 will commence their GCSE studies in September 2022. They will all study the core subjects of English, maths and science and most will study a Modern Foreign Language (either French or Spanish). Most students will then choose three further GCSE option subjects from a wide range available: art, drama, music, computer science, modern foreign languages, business studies, geography, history, religious studies, food preparation & nutrition, design & technology, PE. Q: Will the school have a specialism? A: No. For a number of years now, schools have not been awarded Specialist Status. The awards that some schools still advertise are a legacy of an educational programme that no longer runs. Q: What are the arrangements for children with Special Educational Needs? A: The provision for students with Special Educational Needs will be overseen by the Trust’s Special Educational Needs Co-ordinator (SENCO), who is based at St Clement Danes School. The role of the SENCO is to ensure that barriers to learning are sharply identified upon student entry to the school and then removed through quality first teaching and targeted personalised provision. The SENCO will ensure the provision meets the aims and objectives of the school and clearly meets the statutory requirement. She leads an Assistant SENCO (based at Croxley Danes School) and a team of Learning Skills Practitioners, organising in-class and out-of-class support. The SENCO also contributes to school decisions and delivery in relation to the provision of a differentiated curriculum in Key Stages 3 and 4. Q: Will the school have a sixth form? A: Yes, Croxley Danes will be an 11-18 school and will offer a full suite of A level subjects for sixth form students to study. Q: Where do we buy uniform? Q: What will the catering arrangements be for Croxley Danes in 2019-20? A: Catering is provided by Herts Catering Limited (HCL). There is a kitchen on-site at Croxley Danes School in which the food is freshly prepared and cooked each day. Students use a biometric cashless catering system to purchase food and parents can top-up their accounts with on-line payments. Q: What will be the school transport arrangements to St Clement Danes in 2019-20? A: In 2018-19 the Department for Education is fully subsidising the coach service which transports the students to the school. This is because the school submitted a successful business case arguing that those students accepting places at Croxley Danes based on their proximity to the permanent site at Baldwins lane could not walk or cycle safely to the temporary accommodation at Tolpits lane due to a lack of safe transportation routes between the two sites. The school cannot offer any guarantees that the transportation will continue to be subsidised by the Department for Education in 2019-20; however, another business case will be submitted seeking such support. Q: What will the school be like – it’s hard to decide whether we will like it when there is no permanent school site to visit? A: We hope the Croxley Danes website and Twitter feed (@Croxleydanes) gives you a flavour of what the school is like. We are using St Clement Danes as our blueprint, so please consider following the St Clement Danes School Twitter feed (@SCDSchool) or visiting its website to get a sense of the wealth of activities which take place every week at the school. By attending the Open Evening on 25th September, you will have had a chance to hear about our achievements in 2017-18 and meet the staff who are closely involved – hopefully, this will have given you even greater confidence that the new school is in safe hands. Additionally, by attending the St Clement Danes Open Day on 6th October you will have another opportunity to meet and talk to the key staff. You can also book a visit during our Open Mornings on Tuesday 16th October, Thursday 18th October and Tuesday 23rd October from 9.00am to 10.15am by completing a booking form found in the ‘Admissions’ section of the school website. Open Mornings are only available to Year 6 pupils and their parents. Q: What will be the ongoing relationship between Croxley Danes School and St Clement Danes School? A: Both schools are part of the Danes Educational Trust and, as such, they will permanently be related as ‘sister’ schools. Being in such close proximity, this will assist the deployment of teaching staff, some of whom may work across both schools, and also offer the opportunity for curriculum collaboration at GCSE and A level as well as extra-curricular partnership.